A spacious 2 bedroom mid terraced house located on the outskirts of the town centre. Further accommodation consists of lounge, dining room, kitchen and modern bathroom. The property is double glazed and gas centrally heated. Patio garden and residents permit parking. DESCRIPTION Located on the edge of the town centre is this spacious, period mid terraced house. On the ground floor is a lounge, dining room and modern kitchen. 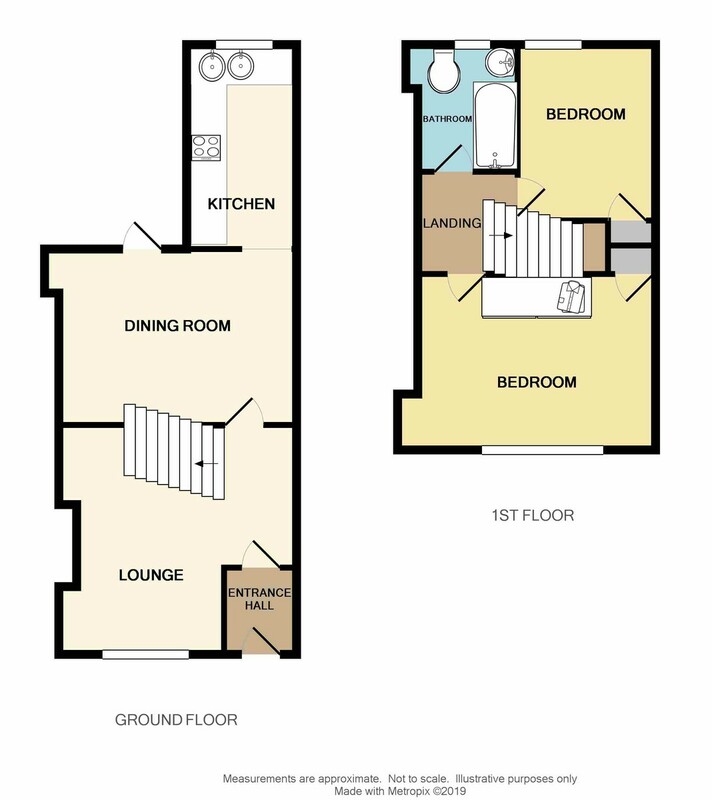 On the 1st floor are 2 double bedrooms and a modern bathroom. The property is double glazed and gas centrally heated. There is a courtyard garden at the rear and residents permit parking at the front. KITCHEN 11' 3" x 6' 0" (3.449m x 1.843m) Fitted with a modern matching range of wall and base mounted units and drawers with roll edge work surface over. Double bowl stainless steel circular sink and drainer unit with mixer tap. Fitted electric oven and hob, spaces for washing machine, fridge and freezer. Central heating boiler, double glazed window to rear and radiator. BEDROOM 1 14' 4" x 12' 9" (4.372m x 3.903m) Double glazed window to front, radiator. Over stairs storage cupboard and fitted double wardrobe with mirrored sliding doors. BEDROOM 2 9' 9" x 8' 6" (2.991m x 2.599m) Double glazed window to rear, over stairs storage cupboard and radiator. BATHROOM Fitted with a modern matching 3 piece white suite comprising of: Bath with mixer tap and shower attachment, low level WC and circular wash hand basin with mixer tap set into vanity unit with cupboard below. Double glazed window to rear, tiled walls and radiator.